My sister loves khichidi for sat'day lunch and she will be so much happy with it :-)...but my DH prefers dal and chawal instead of khichidi so I'm doing that. Last Saturday I prepared rice, dal with tempering of jeera, dry red chili and garlic and bitter gourd fry. 1. Wash and peel bitter gourd and cut in thin slices. 2. Marinate with little salt and turmeric powder and leave it for 10-20mins. 3. 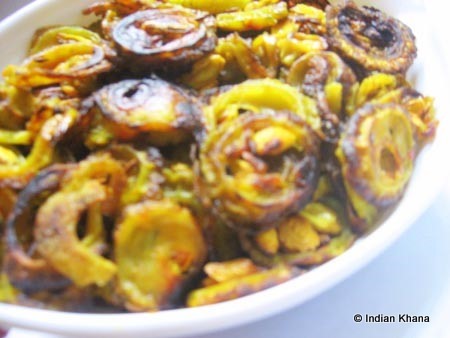 In a pan heat oil, add cumin seeds, add bitter gourd and fry on low flame until it turn black/brown in colour & become crisp. If using amchur then add 2 minutes before turning off the flame. Inviting platter Priti..;congrats on ur awards...enjoy dear!! 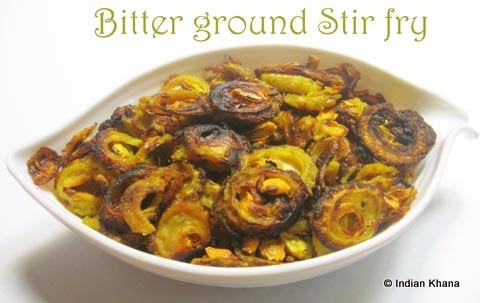 I love bitter gourd! :) Great recipe! BG recipe is winner, lovely Thali! Congrats on ur award! Yummy thali..Bitter gourd is a fav in our house..Congrats on all the well deserved awards..
lovely platter! even me and my hubby dear enjoy..BG. Simple and Inviting. Thali looks great Priti...Congrats on all ur awards...enjoy them. Congrats for the awards and thank you so much for passing it to me! Congrats for all the awards, you deserve them. Thanks for sharing them with me. The Saturday lunch sure looks yummy. Congrats on your awards. Nice platter. Congrats on your award, Biiterguard is my favourite. Nice platter. congratulations for the awards!nice platter! Thats a nice and comforting Thali! Inviting! Congrats on ur awards! Can you pass me that plate! Now it's lunch time here and your plate is making me hungry! Mouth-watering platter! Congrats on the awards! congratulations for the awards, my husband adores karela was abt to post bharwa karela. UR PLATTER REALLY WELCOMING. Nice and attrative platter...congrates on ur awards..
Hey Priti,its really really making me so happy to receive this awars fro u..thanks dear.. Thanks for visiting my blog. congrats on your awards! Thali looks yummy and inviting! Congratulations on your awards.wonderful dinner! Nice comfort food for a weekend !! Hummm yummyyy food, congratulations on ur awards!! !